Okay, so I am the first to admit that I am an old fuddy duddy and that I HATE tattoos of any kind. Yes, my much younger sister has one on her ankle, and yes, my son, the Obnoxious One has one on his back, but…I still really don’t like tattoos! 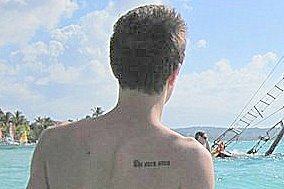 The only reason the Obnoxious One is still alive is that his tattoo can be easily covered up, and is my family’s (Russell) motto – Che sera sera. (What will be will be). The Obnoxious One got his last year as a spur of the moment thing, and is quite proud of it – he claims the chicks and guys love it. Just not his mom. Huh! But, the Demon Child wants to get a tattoo on her wrist and she wants ME to take her. I don’t think so! I was not happy when she got the second piercing in her ears. At the time I figured that was better than a tattoo. So I’m procrastinating…for as long as I possibly can. I’m hoping that she’ll forget all about it. I just read a blog about Henna … that might be an alternative and it only lasts a couple of weeks. Ya, I actually saw that in action today…worth a shot. Thanks.